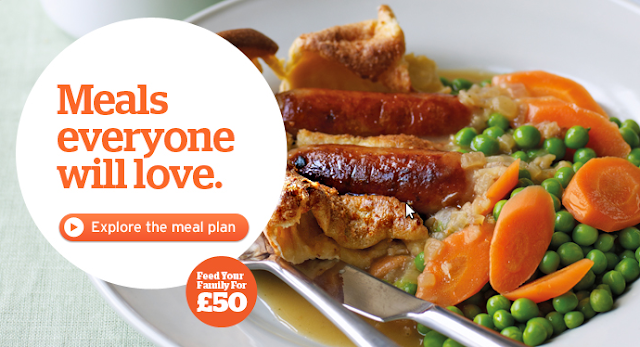 Feed your Family for £50 with Sainsburys? When I first saw those TV adverts suggesting we could feed a family of four for £50, I naturally assumed this meant a week's worth of evening meals only. So it did come as a pleasant surprise to find this cost includes breakfasts and lunches too. For a whole week! Sainsburys have developed an efficient, cost-effective meal plan and recipe guide to cover a week's worth of meals for the whole family to enjoy together. The plan does require sticking to portion sizes and does not include any snacks between meals, though undoubtedly it is a cost effective means of feeding the family on a budget. Not all of the recipes appeal to my family personally, though there's nothing too OTT in there which they would particularly turn their nose up at! It makes me happy to know that in this climate of budgeting and moneysaving, even the big name supermarkets are offering a helping hand to families feeling the pinch. I'll definitely be looking out for future meal plans from Sainsburys for more thrifty meal ideas and would love to see if the idea catches on with other supermarkets too. Personally I don’t think the Sainsbury’s £50 meal plan is flexible enough for most people – someone in my family is usually out at least one night of the week or we have extra people over for dinner. I think there are better sites on the web for meal planning like The Resourceful Cook (www.resourcefulcook.com)? We’ve used it a few times and it suits us better. Lots more choices plus loads of cheap + really tasty recipes. @Matt - Thank you for your comment, and especially for that useful link, I'll be sure to check it out! I do see what you mean about the meal plan being somewhat inflexible, though considering it needs to cater to a majority of nuclear families (and so far as I can tell, is the first major supermarket to attempt this), Sainsburys haven't done a bad job so far. To improve this, I'd love to see (at least a handful of) more accommodating meal plans, even ones which are static and not updated each week or month. Perhaps a list of store cupboard essentials and related recipes would be very useful for families?